С 10 по 11 сентября 2010 года прошли торжества в Ново-Валаамском монастыре в Хейнявеси (Финляндия), посвященные 70-летию основания обители. 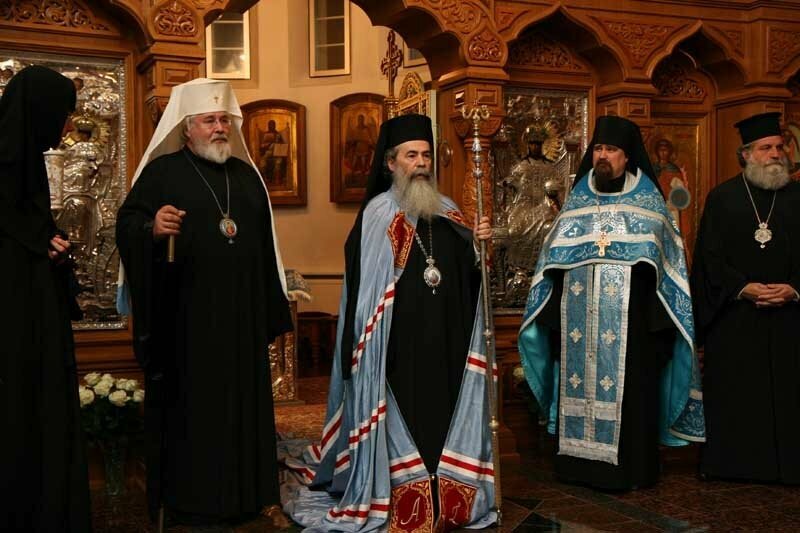 It is a great joy for us to concelebrate this Liturgy with you, dear brother Archbishop Leo, with our brother bishops, with Archimandrite Sergei, the hegumen, and with the monastics and the faithful gathered here. 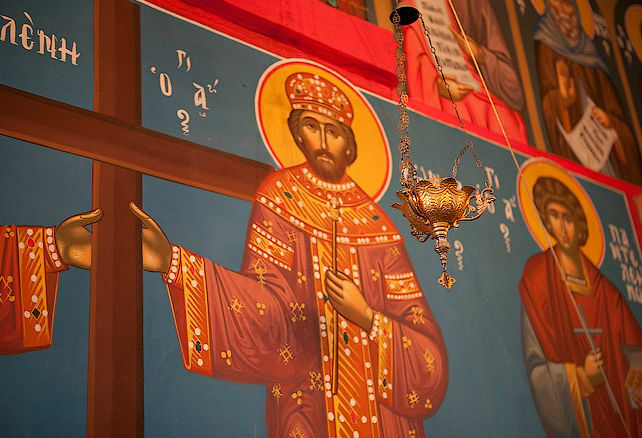 We give thanks today for the foundation of this monastery and as we commemorate Saint Sergius and Saint Herman, we ask for their prayers for you all and for this beloved monastery. We celebrate today not simply the 70th anniversary of the foundation of New Valamo in 1940; we celebrate also the noble monastic tradition that you trace through the monastery of Valamo at Lake Ladoga in Russia and back to the earliest days of the monastic life of the Church. Monasticism is at the heart of the Orthodox Church, and it is fitting that one of the most important signs of the enduring power of monasticism is here in the Church of Finland. For us the desert is a spiritual oasis, and this Monastery of New Valamo, truly a "desert of the North”, unites us with the desert of Palestine. We trace the ascetical tradition of the Church back to Our Lord himself, for it is Our Lord Jesus Christ who is the model for all monastics in the example of his self-giving. "Let the same mind be in you that was in Christ Jesus, who, though he was the form of God, did not regard equality with God as something to be exploited, but emptied Himself, taking the form of a slave”. (Phil. 2: 5-6). "The Son of Man came not to be served, but to serve.” (Mk,10:45). This is the essence of the monastic life, and this is the lesson that monasticism teaches the whole Church. Monasticism is not a movement; it is a response in love to God. All faithful Christians are called to imitate Our Lord, and, whether God calls us to life in the convent or in the world, monasticism keeps us all true to this ascetical ideal. This monastery of Valamo, whose founders we commemorate today, is a proof to us that monasticism is not something that existed only long ago in the ancient life of Egypt or Palestine. As Our Lord has said, "the Spirit blows where it chooses” (Jn, 3:8), and here we experience the truth that, by the grace of the Holy Spirit, in the reality of the genuinely ecumenical life of the Church, the distance between Palestine and Valamo has been bridged. Christ the Pantocrator is our common earth and our common heaven. And monastic communities like New Valamo are nurseries of the spiritual life and the ladders for us from earth to heaven. Here monasticism survived at a difficult time for the Church in this region, and you kept alive the ascetical traditions of the Church in the face of great trials. 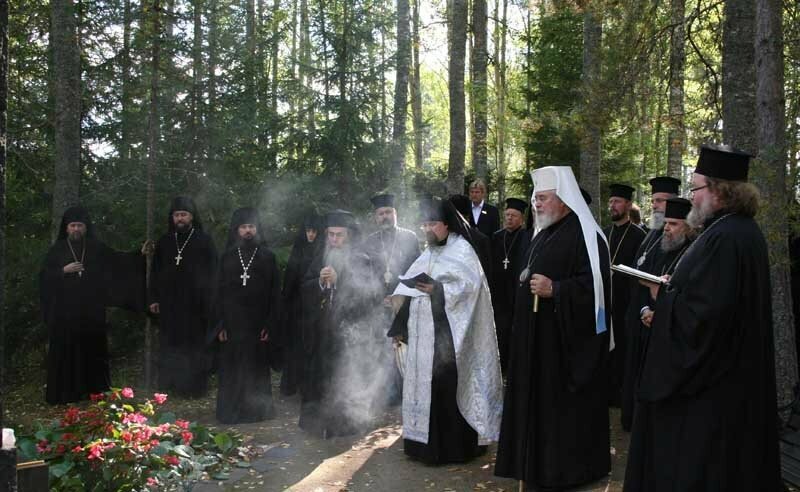 So you have kept burning the true ecumenical vocation of monasticism, for in our monastic communities people are themselves the instruments of the love of God, which seeks not its own good, but the salvation of all without exception. 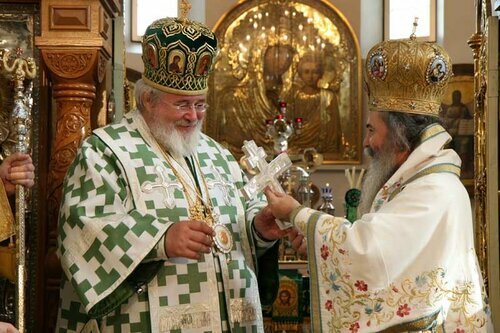 The members of the Orthodox Church are untied one to the other in this Euharistic feast. In this and every Liturgy we experience unity in Christ and at the same time we have a foretaste of the Kingdom of Heaven. It is precisely here, in this act of love that we demonstrate our oneness, and in spite of the fact that there are thousands of Eucharistic tables around the world, the Body of Christ is always one and undivided. 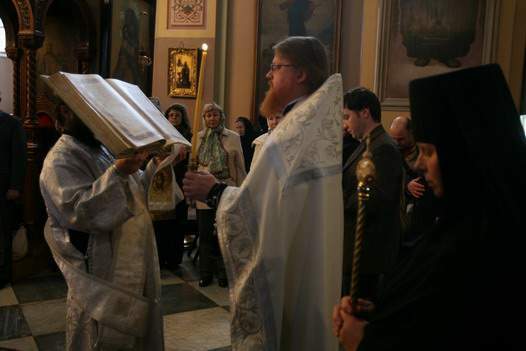 Our presence in Finland is a sacramental sign of this eternal reality and we bring to all the faithful of the Finnish Orthodox Church the blessings of the holy Places, and especially of the Tomb of the Anastasis and the Tomb of the Metastasis in Gethsemane. 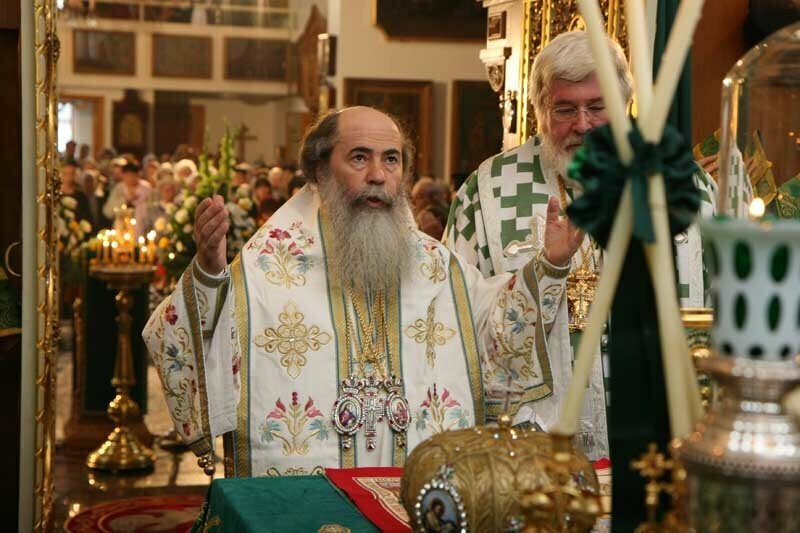 We also offer our special prayers for you, Your Eminence, dear Archbishop Leo, to you, Archimandrite Sergei on your Name Day, which is your spiritual birthday, and to this monastic community. 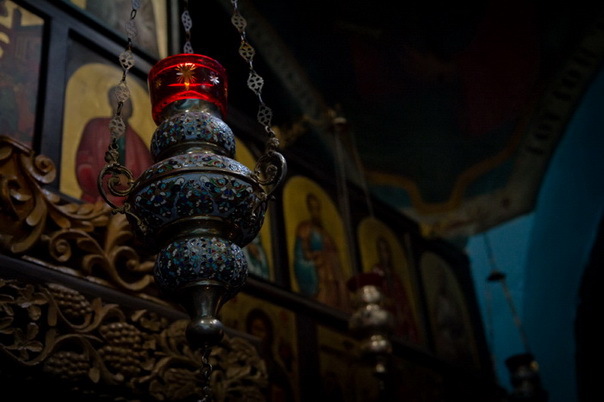 May Christ, who is the pattern of our life and our True God, through the intercession of the Virgin Mary, and by the prayers of Saint Sergius and Saint Herman, the founders of Valamo, bless us all and save us, for he is good and he loves humankind. Торжества по случаю 70-летия основания Ново-Валаамкого монастыря.